Doctor of Traditional Chinese Medicine Vancouver Area Canada | Why is this Herb Named After a Crane? Why is this Herb Named After a Crane? 11 Mar Why is this Herb Named After a Crane? One summer two Chinese officials were making a long trip to Peking (now called Beijing) to take a national examination for promotion. Seeing that time was almost running out, they hastened their journey, only to find themselves in a desert without any village in sight. They were hungry, thirsty and physically exhausted, but they could find neither water to drink, food to eat, nor a shady place to rest. One of the officials suddenly developed a nosebleed and the bleeding wouldn’t stop, so his fellow traveler ripped a sheet of paper from an old book and squeezed it into his friend’s nose. At that moment, two birds flew past them, one of which cried loudly. The official with the nosebleed looked up and saw two red-crowned cranes circling over his head. “Dear birds, I wish I could borrow your wings to fly out of this desert,” shouted the official, with both arms outstretched and his mouth wide open. And so he put the grass in his mouth and started chewing it as if it were a piece of gum. Oddly enough, the nosebleed stopped after a short while and both officials started jumping with joy. “The birds gave us magic grass!“ one of them said jokingly. The two Chinese officials made it to the examination hall in the capital just in time for the exam and both of them passed and got promoted. When the two officials met again some time later, they recalled the event in the desert and began to wonder about the grass that stopped the nosebleed. They started making inquiries about the name of the grass, but no herbalists knew anything about it. They drew pictures of the grass from their recollections and ordered their subordinates to search for it. Finally, many years later, the grass was found growing along some hillsides. It was a perennial herb with long soft hairs over the whole plant. Discovering that the plant still had no name, the officials named it after the red-crowned crane. From the point of view of modern medicine, Xian He Cao has the properties of a platelet-coagulating hemostatic. 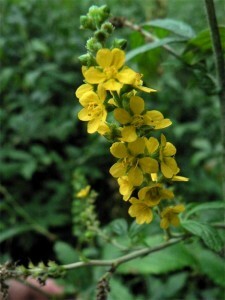 It stops bleeding, particularly in the lungs, and is used to stop vomiting of blood, coughing up blood, nosebleeds, as well as excessive vaginal bleeding.